As part of the First 5 LA-funded Early Childhood Obesity Prevention Initiative (ECOPI), the Los Angeles County Department of Public Health (DPH) in partnership with Change Lab Solutions has released Marketing Matters: A White Paper on Strategies to Reduce Unhealthy Food and Beverage Marketing to Young Children. The white paper discusses the critical need for such strategies to address unhealthy marketing of foods and beverages to children. Food marketing has a significant impact on the diet and health of children as companies are spending $1.79 billion annually to specifically market food to children. The overwhelming majority of these foods are of poor nutritional quality, which leads to overconsumption of unhealthy foods and an under consumption of fruits and vegetables. In LA County, nearly one in four children (24%) ages five years and under drinks one or more sodas or sugar sweetened beverages each day. Additionally, 42% of children five years and under consume fast food at least once a week. Poor dietary habits, which can be a result of unhealthy food marketing, can contribute to childhood obesity and other chronic diseases. The obesity rate among 3- and 4- year old children receiving WIC nutrition services in LA County was 19% in 2014, almost as high as the obesity rate among adults in LA County at 24%. Marketing Matters provides a summary of the issue, legal background for local strategies, and a list of policy recommendations categorized by legal feasibility. 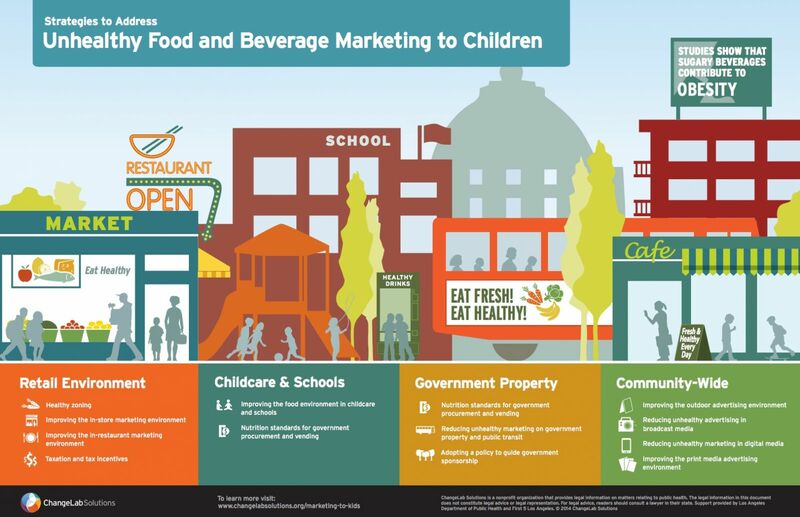 Additionally, an accompanying toolkit includes tailored handouts targeting policymakers, parents, and community groups with calls to action on how they can reduce the marketing of unhealthy foods and beverages. The ECOPI’s Choose Health LA Kids Program is working with 20 community agencies, many of which serve First 5 LA’s Best Start communities, to support and partner with parent coalitions to reduce the marketing of unhealthy foods and beverages in their communities. ECOPI is managed and implemented by the County of Los Angeles Department of Public Health (DPH). The five-year, $41,197,400 project aims to reduce obesity among young children ages 0-5 countywide, and addresses First 5 LA’s previous FY 2009-2015 Strategic Plan goal of Children Maintain a Healthy Weight.